Earlier this year at PAX Australia, I had a brief look at Assault Android Cactus (AAC), a one to four player local coop "bullet hell" game featuring a cast of feminine android protagonists. Responding to a distress call from the crippled Genki Star, Junior Constable Cactus soon discovers she is overwhelmed by malfunctioning worker robots. Desperate to save the ship, Cactus battles her way through deck after deck of rampaging robots and bosses whilst befriending and recruiting androids along the way to heart of the ship, where presumably they will find the cause the Genki Star's malfunctions. Assault Android Cactus features four main playable android characters: the titular Cactus, a plucky, but perhaps out of her depth police android; Holly, a nervous inventory manager; Lemon, a trainee medic with a happy outlook; and Coral, a fitness instructor with an outgoing personality. In addition to these four, a range of additional unlockable characters are planned. The current Steam Early Access and Humble Store DRM free versions of the game include Starch (who is my personal favourite), an insane android with a mysterious past. Starch's silly presentation shows that this game doesn't take itself too seriously and values fun above all else. Something that immediately stands out is that all of Assault Android Cactus' playable characters are feminine (can androids be female?). This is rare for a game that isn't focusing on overtly sexualising its characters, and though they do call out to some established female stereotypes, it feels that they're still solidly constructed and cared for by their creators. I'm hoping that the completed game will expose more depth in AAC's characters and give them arcs to traverse, as they all feel like good starting points. Visually, AAC harkens to an aesthetic that I associate with mid to late 90s 3D games, but couples that with modern polish and attention to detail. Deceptively simple character meshes have been infused with character and detail through some great textures and animation that bring charm and life to the protagonists and their enemies. The polished levels available in the current version of the game span two decks of the Genki Star, each with a distinctive palette and detailing that gives a sense of progression. In addition, the game contains a number of in-development levels, giving some insight into the development life cycle of an AAC level as core layout, gameplay and pacing are tuned before the final cosmetic touches are added. The game's HUD is dominated by a score tally toward the bottom, a combo counter to the left and a large battery countdown in the top centre of the screen, constantly reminding players of the "ticking clock" that Assault Android Cactus offers in place of a lives system. With "deaths" (or knockdowns) costing time rather than imposing a hard end-of-game condition, AAC feels more forgiving than many other "bullet hell" games, whilst a time remaining score bonus still offers a challenging target for skilled players. In the top left of the screen, a compact health and weapon status indicator is unobtrusive and often feels lost amid the the game's intense action, leaving audio cues the primary means of reading this information. A ring indicator for secondary weapon ammunition/cooldown is also located at the feet of the player character. This renders above enemies, but still becomes difficult to read during crowded moments. Assault Android Cactus' sound design feels flawless, with good mixing keeping effects and music identifiable at all times. Character specific voice cues signal weapon status, battery drops, collected powerups and combo milestones, standing out within the game's soundscape and giving more present indicators than the game's HUD. Similarly, enemy firing sounds, damage sounds, each character's weapon effects, are distinctive and audible against the chaos. Each deck also features its own music track, complimenting the atmosphere created by the visual aesthetics. AAC's music tracks have variants which increase in complexity at climactic points in a level when the player has a combo count above a particular threshold, defining a clear peaks of tension and excitement in each level's pacing. Where Assault Android Cactus shines (even in its current unfinished state) is in the execution of mechanics, where the same attention to detail and stylistic choices already covered have been brought to bear on creating a robust and satisfying experience that is as enjoyable the fiftieth time as it was the first. The cast of enemies features a good mix of ranged and melee robots with different behaviours, creating interesting emergent technical challenges when combined. Enemies come in streams of small (or large) groups rather than monolithic waves, allowing for much more finely tuned pacing whilst at the same time letting the player influence the speed at which the game progresses. End-of-deck boss encounters excluded, most of the levels currently included in the game feature some kind of dynamic component, ranging from mobile hazards and moving walls to dynamic limited visibility lighting and reconfiguring floors. These aspects add even more carefully placed punctuation to each level's pacing, and give each level its own distinctive gameplay. The most impressive aspect to me is the how much difference there is between the play styles that each playable character leans towards. When I first encountered Assault Android Cactus, I was dubious about how distinct the gameplay could be between characters, however after sitting down to play, it became immediately apparent that each android's primary and secondary weapons encourage and support markedly different styles of play. Cactus' all purpose assault rifle and flame thrower offer a versatile primary weapon at any range with the limitation of close quarters secondary fire. Holly's seeker pistol offers auto aiming at the cost of being able to target specific enemies, whilst her slow cannonball secondary weapon can plough through multiple enemies, leaning toward a more flighty/less targeted style of play. Lemon's fast firing Spreadshot deals less damage than Cactus' assault rifle, making it more effective against larger groups of weaker enemies, something that the blast radius on her secondary rockets compliment well. Coral's slow fire, short range, high powered shotgun favours a much more strategic hit and run approach, whilst her enemy damaging and fire repelling plasma field can act as both cover and tactical area denial. 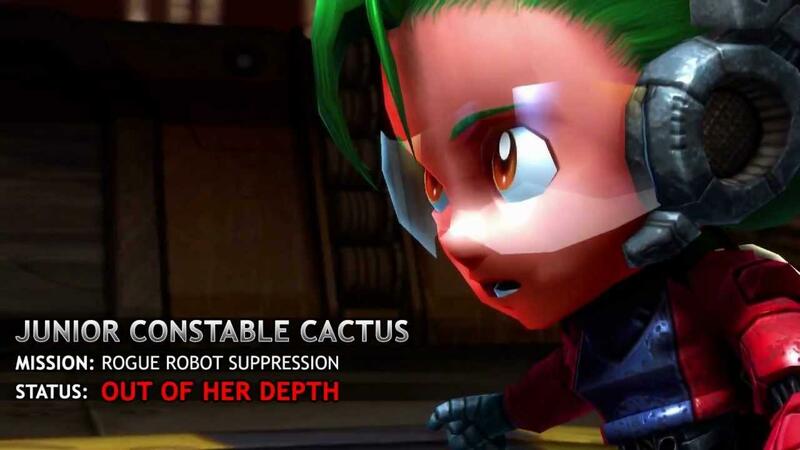 The unlockable android Starch at first seems to have overlap with Cactus, but her Laser's higher damage at close proximity allows it to be treated almost as a lance, favouring direct charges against powerful enemies, counterpointed by her auto targeting Micro Missile secondary weapon. The final game is expected to have several additional unlockable androids, and I look forward to seeing if the level of diversity can be maintained across a broader cast of characters. Up to four player local drop-in coop is provided via controllers (mouse and keyboard support is only available to player one), and combat scales surprisingly well, with individual players feeling vulnerable enough to give value to coordination. Competitive social play is made available via global online leaderboards which can also be filtered to show friends' scores. It's been fascinating and enjoyable to watch this game expand over the past few months, and I can imagine it becoming a living room favourite as Valve's recent Steam Universe announcements encourage more people to experiment with PC platforms away from the desk top. It's also nice to see the developers from Witchbeam active in Assault Android Cactus' Steam Community hub, openly taking feedback and engaging with players as the game's community grows. Assault Android Cactus can be pre-ordered for Linux, Mac OS and Windows via the Assault Android Cactus website (includes DRM free versions and Steam key) and Steam Early Access and is expected to launch in November. A demo containing 5 levels is available on Steam now. From that trailer video, the massive things that are happening to the environment around you look crazy! In a good way. When you say four player co-op, is this storyline 4 player co-op? Or is it survival co-op without any relation to the story? Quote from Sabun From that trailer video, the massive things that are happening to the environment around you look crazy! In a good way. You can play the story campaign levels co-op and progress through as you would if you were on your own. I believe it's part of the plot that Cactus recruits the other androids to help her as she progresses through the game, but I'm not certain that that's exposed at all in-game. It's pretty hectic, but still very readable. I didn't know there was a demo, I'll check it out. Thanks for sharing Cheese! I've spoken to a few Linux gamers who've said they don't bother trying demos because they often don't suppose Linux when the full game does.